Missouri River Communities Network sponsors 13 AmeriCorps Members at 8 nonprofit organizations who, in 2017, taught 41,000 students how to grow and eat healthy food, and provided 100 low-income families with garden mentoring to learn how to grow their own food and reduce food insecurity. In 5 years we have coordinated 60 AmeriCorps Members who have taught more than 70,000 young students and low income families how to grow, prepare and eat healthy food in order to reduce the epidemic of obesity and food insecurity in our communities. 32% of MO students are obese; and it’s expected to rise to 60% in 10 years. Studies show students will eat healthy food if they help grow it. MRCN’s grant has a 50% match. Every $10 donated to MRCN provides $20 to support healthy food education. All donations are matched by grant funds; AmeriCorps sites welcome volunteer help. Call MRCN. Missouri River Communities Network shared a post. 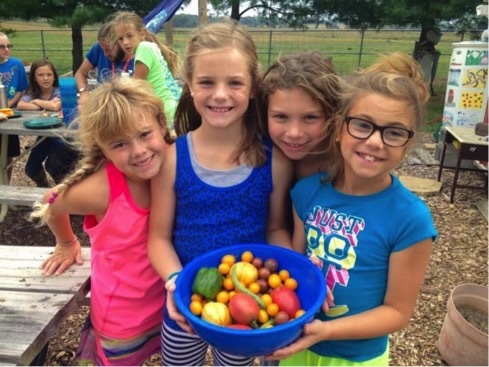 Check out the cool Middle School Cooking Club video by our Missouri Healthy Food AmeriCorps members serving in Ashland with the Southern Boone Learning Garden!!! Missouri River Communities Network shared a link. Applicants interested in applying to the Beginning Farmer and Rancher Development Program have until May 16, 2019 to apply for FY 2019 funds, and until February 13, 2020 to apply for FY 2020. 💙Weekend Update: Over the last few days, our team deployed to the St. Joseph flood zone helped set up a Volunteer Reception Center, where they registered over 600 volunteers & helped bag over 60,000 sandbags! Jefferson City is one of five places under a flood warning.